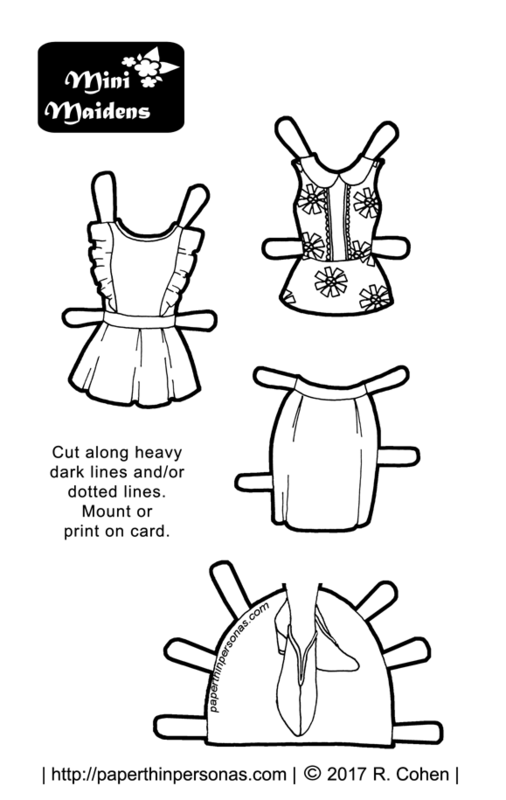 So, for today’s paper doll clothing I created a skirt and two sleeveless blouses for the Mini-Maiden’s printable paper doll series. The designs are straight from the fashion magazines that seem to pile up on my coffee table while I’m not paying enough attention. Truth be told, I’m not a big fan of summer. I dislike the heat and I really dislike the humidty. I never felt this way until I moved to Alabama and now I’ve learned why people don’t like summertime. I do, however, enjoy looking at the seasonal fashion magazines though and seeing different clothing ideas. Flipping through fashion magazines always seems to make me want to draw. I see all sorts of things I’d like to try to recreate for my paper dolls. Today’s pair of sleeveless tops and skirt all come from different fashion magazines. I tend to use Instyle and People StyleWatch most often. They have very easy to see photos of clothing. In the magazine, the paper dolls booties were heavily decorated with cut outs. When I tried to draw the cut outs, they ended up looking really odd. So, I have omitted them from today’s paper doll. You’ll just have to imagine cut outs. Love today’s paper doll clothing? Hate it? Let me know in a comment. I just wanted to tell you how wonderful your paper dolls are to me. I really enjoy coloring them and collecting them. My favorites are the mini maids and poppets. I think the boots with this outfit are so cute.Thank-you so much for what you do. You’re welcome. I love hearing from readers. The Mini-Maidens are one of my favorite series, too. I love the top on the left. I cannot wait to print this page out and colour it. I think this set would look great in brights, pastels, or even a classy buttery yellow and cream combination. I may have to colour this one more than once! Thank you so much for all the awesome paper dolls. You’re welcome! I love that you enjoy them.